"Defiantly I spread my legs, lowered my head, flattened my ears, bared my teeth, and for thefirst time in my life, I growled at a human " Puppy Max doesn't have the easiest start in life. After being taken from his mother, he faces hunger, living alone outside, a vicious dog next door, and even menacing raccoons. But just when this Australian Shepherd thinks it can't get any worse, he is abandoned at an animal shelter. Max is rescued and fostered in a home complete with canine companions-Miles, a benevolent fellow Aussie, and cantankerous, bossy little Muffin. He also lives with three cats, two parakeets, and one incredible mistress. Can a dog like Max go from years without a bath to unconditional love and acceptance? Or will hisnew family abandon him again? Max is never sure-until the ultimate challenge shakes his world. 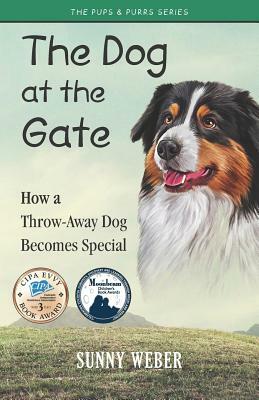 Fans of classics like Black Beauty, Thomasina, and Beautiful Joe, which feature redemptive bonds between animals and people, will find The Dog at the Gate: How a Throwaway Dog Becomes Special offers a touching tale of love and triumph.